The flamethrower, which brought terror to French and British soldiers when used by the German army in the early phases of the First World War in 1914 and 1915 (and which was quickly adopted by both) was by no means a particularly innovative weapon. The basic idea of a flamethrower is to spread fire by launching burning fuel. The earliest flamethrowers date as far back as the 5th century B.C. These took the form of lengthy tubes filled with burning solids (such as coal or sulphur), and which were used in the same way as blow-guns: by blowing into one end of the tube the solid material inside would be propelled towards the operator's enemies. The flamethrower was inevitably refined over the intervening centuries, although the models seen in the early days of World War One were developed at the turn of the 20th century. The German army tested two models of flamethrower - or Flammenwerfer in German - in the early 1900s, one large and one small, both developed by Richard Fiedler. The smaller, lighter Flammenwerfer (the Kleinflammenwerfer) was designed for portable use, carried by a single man. Using pressurised air and carbon dioxide or nitrogen it belched forth a stream of burning oil for as much as 18 metres. Fielder's second, larger model (the Grossflammenwerfer), worked along the same lines but was not suitable for transport by a single person, but whose maximum range was twice that of the smaller model; it could also sustain flames for a (then) impressive forty seconds, although it was decidedly expensive in its use of fuel. Having tested the Flammenwerfer in 1900 the German army deployed it for use in three specialist battalions from 1911 onwards. It was put to initial wartime use against the French in the south-eastern sector of the Western Front from October 1914, although its use was sporadic and went largely unreported. The first notable use of the Flammenwerfer came in a surprise attack launched by the Germans upon the British at Hooge in Flanders. Springing forward at 0315 on 30 July 1915 the Germans made effective use of the portable Flammenwerfer, with gas cylinders strapped to the back of the men responsible for using the instrument, a lit nozzle attached to each cylinder. The effect of the dangerous nature of the surprise attack proved terrifying to the British opposition, although their line, initially pushed back, was stabilised later the same night. In two days of severe fighting the British lost 31 officers and 751 other ranks during the attack. With the success of the Hooge attack, at least so far as the Flammenwerfer was concerned, the German army adopted the device on a widespread basis across all fronts of battle. The Flammenwerfers tended to be used in groups of six during battle, each machine worked by two men. They were used mostly to clear forward defenders during the start of a German attack, preceding their infantry colleagues. They were undeniably useful when used at short-range, but were of limited wider effectiveness, especially once the British and French had overcome their initial alarm at their use. The operators of Flammenwerfer equipment also lived a most dangerous existence. 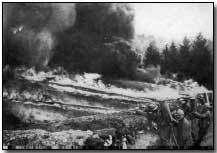 Quite aside from the worries of handling the device - it was entirely feasible that the cylinder carrying the fuel might unexpectedly explode - they were marked men; the British and French poured rifle-fire into the area of attack where Flammenwerfers were used, and their operators could expect no mercy should they be taken prisoner. Their life expectancy was therefore short. The British, intrigued by the possibilities offered by flamethrowers, experimented with their own models. In readiness for the Somme offensive they constructed four sizeable models (weighing two tons each), built directly into a forward trench constructed in No Man's Land a mere 60 yards from the German line. Each was painstakingly constructed piece by piece, although two were destroyed by shellfire prior to 1 July 1916 (the start of the Somme offensive). The remaining two, each with a range of 90 yards, were put to use as planned on 1 July. Again highly effective at clearing trenches at a local level, they were of practically no wider benefit. Their use was consequently abandoned. Similarly the French developed their own portable one-man Schilt flamethrower, of a superior build to the German model. It was used in trench attacks during 1917-18. The Germans produced a lightweight modified version of their Flammenwerfer, the Wex, in 1917, which had the benefit of self-igniting. 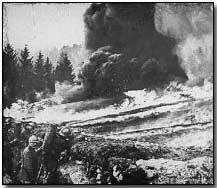 During the war the Germans launched in excess of 650 flamethrower attacks; no numbers exist for British or French attacks. By the close of the war flamethrower use had been extended to use on tanks, a policy carried forward to World War Two. Flame-throwing equipment, albeit somewhat refined, continues in use to the present day.